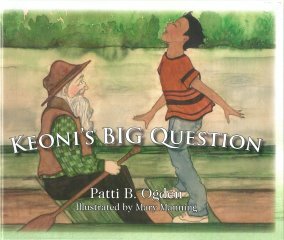 Keoni’s Big Question is very special to me because it tells such a sweet story of a curious little boy that just wanted to know more about God. The little boy reminded me of myself. As a child I was very curious about the deep questions of life and I was just as determined to find the right answers. Keoni’s Big Question has a beautiful message with a surprising answer that will impact it’s readers for a lifetime. This 32 page fully-illustrated book is a wonderful book for all children, but I have had its meaning inspire parents as well. It’s an endearing story of faith, Christian values and the how and why of reaching out to God for answers in our life. They say good authors are good readers and I agree with that. My mind often starts to form ideas after reading inspirational items and great literature. One of the biggest stumbling blocks is coming to a word road block. You know what you want to say but the correct words or phrases escape you. The on-the-tip-of-my- tongue problem. That is frustrating! I get past this by going for a long walk to clear my head and then flipping through reference tools like my Thesaurus. This is something I wanted to do since a high school creative writing class. I think the motivation is the basic human desire to express ourselves. Writing is a channel that we can freely do that. Keoni’s Big Question is centered around a fishing trip Keoni takes with an old family friend. The setting was easy as it was a part of the original story told by William Branham. Yet that was only an outline and I had to fill in the gaps with fiction. I decided that the fishing trip had to become dangerous to make a way for Keoni to communicate with God so he would come naturally to the answers to his big question. Keoni inspires me because he never gives up. He knows there are correct answers to his questions and he persevered until he was satisfied in his soul. I admire that. It shows great faith. The friction in this story are the many disappointing answers that Keoni receives when he first begins his search for answers. Sadly, this is too often seen in our modern society- people who are too busy to sit down and have serious conversation with children. Keoni begins to feel rejected and pacified and the reader will soon feel great empathy to what he is going through. Is there a way to tie your book topic to current events? If so, tell us about how you could do that. I have a blog to feature information and examples about tying books into current events that might be a good place for you to promote your book. Keoni’s Big Question and it’s message is very important – now more than ever. Headlines and current events are becoming more fearful about the state of the world, the economy and the prophecy of the end of times. Children are especially sensitive to these things, they see their families worried about job loss, higher bills to pay, etc. This book helps them to realize there is a higher power to call upon. One that can instill peace and joy. Watch for the Keoni’s Big Question book trailer in May. I also have two more books that are coming out this year. t teaches children the virtues of Godly character and faith. “Momma, Am I Pretty?” is about a young girl who deals with her first experience of religious persecution and how the wisdom of her mother helps her through her emotional reaction. Illustrator and designer Robert Sauber is busy working on this project and we hope to have this one out by late summer. Thank you! It was my pleasure. I would like to invite readers to stop by our website.